Mad Catz will have an extra special Limited Edition Street Fighter V Chun-Li Arcade FightStick Tournament Edition 2 all ready to go before the end of the year for Street Fighter fans. 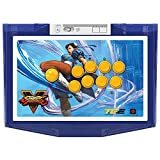 The new officially licensed product is a standard PS3/PS4 Arcade FightStick TE 2 stick but with special Chun-Li art and color-scheme and a bonus shoulder strap. Those looking for a new stick will need to shell out $229.99 for it when it becomes available on December 4th. Hop on over to Amazon or Mad Catz to pre-order it. Take a look at some product shots and the announcement below. Mad Catz Interactive, Inc. (“Mad Catz”) announced today the start of pre-orders for a limited edition Tournament Edition 2 FightStick, the first product in the company’s Street Fighter V branded fighting game controller range, through its licensing agreement with Capcom. Compatible with PlayStation 3 and the PlayStation 4 computer entertainment systems, the Chun-Li themed stick has been designed as a precursor to the upcoming, all-new Street Fighter V themed range, expected to arrive in 2016. A homage to the company’s much loved Street Fighter IV Chun Li FightStick, the new limited edition controller features premium components supplied by legendary Japanese arcade experts Sanwa Denshi. A solid metal base coated with durable foam padding provides weight and stability during tournament play, and easy hinged access to the FightStick’s internal components, allows for hassle free modification. The Mad Catz FightStick range; including the new Chun-Li TE2 FightStick is the official FightStick range of the Capcom Pro Tour, the premier global series of competitive eSports fighting gaming tournaments held to sold-out crowds around the world and streamed live on Twitch.tv, the world’s leading social video platform and community for gamers.